"There is widespread concern", said Mrs May in her Commons statement yesterday, "about the possibility of the UK's leaving without a deal". She then noted that, "there are those on both sides of the House who want the Government to rule that out", but this was not for the prime minister. "We need to be honest with the British people about what that means", she said. "The right way to rule out no deal is for the House to approve a deal with the European Union, and that is what the Government are seeking to achieve. The only other guaranteed way to avoid a no-deal Brexit is to revoke article 50, which would mean staying in the EU". Moving on, she addressed the other factions in the House. For those who wanted to extend the Article 50 period, she observed that this was "not ruling out no deal, but simply deferring the point of decision". Furthermore, she said, "the EU is very unlikely simply to agree to extend article 50 without a plan for how we are going to approve a deal". Thus, she observed, "when people say, 'rule out no deal', what they are actually saying is that, if we in Parliament cannot approve a deal, we should revoke Article 50". But, if that was the consequences of what they were saying, Mrs May was opposed to it. "That would go against the referendum result", she declared, "and I do not believe that that is a course of action that we should take or one that the House should support". Nor did she believe there was a majority for a second referendum, which meant that those MPs who thought that this was the answer would have to "think again about their approach". The plan, then, was to talk to colleagues, including in the DUP, to consider how we might meet our obligations to the people of Northern Ireland and Ireland in a way that can command the greatest possible support in the House. She would then "take the conclusions of those discussion back to the EU" in the hope of getting concessions. Whatever she does get, the EU has already indicated that it will be slight. This will leave us with the vote on 29 January. And when the more egregious MPs have finished playing their games, we will be in exactly the same position that we were last December. Either the House approves the Withdrawal Agreement or the result will be a no-deal Brexit. And if the House chooses the latter, by design or default, then Mrs May is right about one thing: "We need to be honest with the British people about what that means". Much of how we fare in the event of a no-deal depends, of course, on the degree to which our closest neighbours – and especially France – are prepared to deal with the cliff edge. And, to date, there has been a perverse tendency by the "ultras" and their allies - aided by the lamentable inadequacies of the UK media – to pretend that preparations are far more advanced than they actually are. This came to a head nearly two weeks ago when the BBC Today programme interviewed Jean-Marc Puissesseau, a local politician who currently occupies the political post of President of the ports of Boulogne-Calais. His unguarded and largely misleading comments were seized upon as proof positive that concerns about major congestion at Calais were "scaremongering". MP Bernard Jenkin even claimed that the interview, "completely spikes the fear campaign about WTO Brexit causing queues at Dover". Particularly relevant were assertions that a single veterinary and sanitary inspection point would be developed off-site, at a place called La Zone Turquerie, so as to avoid congestion. Puissesseau claimed that the port authorities had "already been building infrastructure and parking", so that operations, "will not influence the traffic in Dover". Like similar lies that have spread halfway round the world before the truth had even laced up its boots, this one has had a fair degree of mileage. But, even a week ago, the claims were looking shaky, albeit only to the readers of this blog, despite even more misleading claims, this time from Telegraph hack James Rothwell. He claimed of the Turquerie site, that "diggers are laying the groundwork for a warehouse complex for inspectors and a lorry park", citing Jean-Paul Mulot, a spokesman for the president of the Hauts-de-France region, who said he was "confident the new complex would be ready within 11 weeks". In addition to my work, however, further crumbling at the edges of this claim came from an unlikely source, the French edition of Euractiv. Referring to the "additional controls" needed at Calais because of the UK's exit from the single Market, it also cited Jean-Paul Mulot. But this time, Mulot spoke only of having "taken out options" to buy land and modular structures for the Tunnel and Calais port, "because we do not yet know the outcome of the problem". The article then had a familiar figure chip in, none other than Jean-Marc Puissesseau who gaily declared that there was an inspection facility under construction in Calais, "on the grounds of the port". That, of course, was not what he was saying earlier, but it reflects the confusion over siting, where local politicians seems to have been under the mistaken impression that remote siting of border inspection posts was permissible, until disabused by Ms Céline Gauer, Deputy Secretary General of the European Commission. But we now have Pierre-Henri Dumont, an MP for the Calais region, who in a debate in the National Assembly last Wednesday spoke bitterly of "procrastination" by central government. He claimed that the minister responsible, Nathalie Loiseau, Minister for European Affairs, did not know how many veterinarians would be needed. And the number of customs officers assigned to controls was "vastly inadequate compared to that of our European neighbours". As to the infrastructure – the buildings needed to house all these new officials – he emphatically declared that they would not be ready on time. Emergency provision, based on "modular construction", would be needed, if there were to be any facilities at all. Dumont then quoted Jacques Gounon, president and CEO of Getlink (Eurotunnel). Last week, the CEO had complained that Paris was "in the dark" and had made no serious preparations for Brexit. The state did not know exactly what they would need and, as long as customs and veterinary services had not clarified their requirements in terms of space and infrastructure, "Eurotunnel could not file a building permit". Initially, Dumont claimed, there had been two options prepared, a single inspection point serving both the tunnel and the port, and two sites with two separate entrances. Yet, in six months of meetings and round tables, Paris had not been able to give a simple answer as to which option to progress. Repeating his complaint in a recent tweet, Dumont asked bitterly of the central government, "How do you expect port operators to build infrastructure when you are unable to tell them what you want and do not know the number of customs and veterinary checks?" 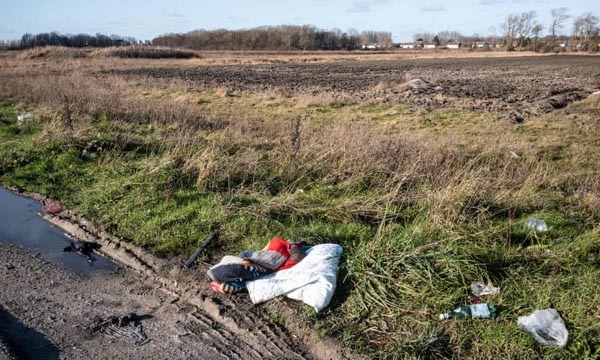 This is such a very different picture from what has been presented to us in England that it is scarcely possible to believe that the British media have been talking about the same issue – until yesterday that is, when the Guardian finally sent a reporter with a lorry driver over to Calais, bringing back a photograph (above), said to be of the planned border inspection post. As can be seen, work has yet to be started. As it stands, though, the decisions as to where even to site the facilities have yet to be made, and it will then be for the operators to finance the new facilities. But, so critical has the finance issue become that mayor Natacha Bouchart has asked prime minister Édouard Philippe for a special "Brexit intervention fund". The prime minister was in Calais and Coquelles last Friday, together with Gérald Darmanin and Nathalie Loiseau, when Bouchart spoke of the creation of two temporary centres, one at the port of Calais and the other at the Channel Tunnel in Coquelles – covering customs controls and veterinary services. These would be "emergency measures" that would "sweep aside" - at least for the moment – the joint port/tunnel control project on a shared Turquerie site. But this being something of Bouchart's pet project, she could not resist pushing it in front of the visiting ministers: "The Turquerie area can play a role", she said. However, while Bouchart wants the creation of "an economic development zone between the port and the tunnel", it looks as if she got short shrift from Paris. The prime minister confirmed that the state would pay €8.5 million for tourist projects, but there was no special Brexit money for Calais. There had to be equal treatment for all territories. The effects of this will be only too obvious in the event of a no deal. With Puissesseau claiming that there would be no congestion because of the central site, it follows that temporary facilities, cobbled together in modular buildings, will hardly be the most efficient way of handling the necessary checks. Congestion must be regarded as inevitable. Perhaps it is just as well that the papers are squealing about a drop in traffic as much as 87 percent – something noted by Sky News even though it had been pointed out by the Financial Times on 31 December and we wrote it up on the blog on 2 January. Still, give it a few more weeks and the legacy media in general might just begin to notice that things are not quite right at Calais (having ignored the Guardian report), no doubt led by Sky News's Faisal Islam who can parade his clever discoveries, to show us how wonderful he is. But, if you want the details earlier and better - without the drama queens - just read this blog.